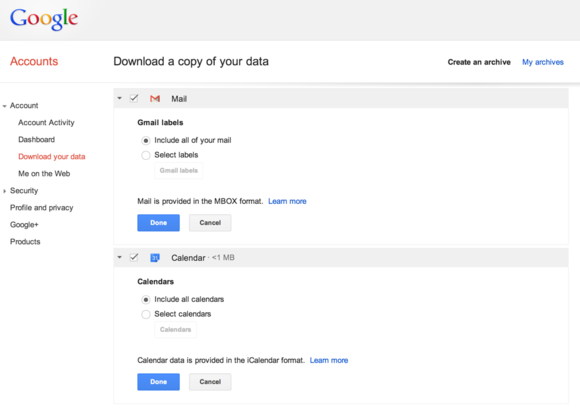 Rejoice, Google users, for today, the company announced new data-saving capabilities that will finally—finally!—allow you to export and back up your Gmail and Google Calendar data without needing to turn to third-party software and arcane workarounds. You can download everything in one fell swoop, or pick and choose individual calendars and Gmail labels to export. Gmail messages come in .MBOX format, while calendars download in as an .ICAL. Both file types are widely used with mail and calendar applications. Yep, you can finally drag your Gmail messages to another service without jumping through hoops. What are you waiting for? This feature’s been a long time coming, and it’s always a good time to back up your data.